We’ve made apartment hunting easy by offering the very best in community and apartment amenities, all for a competitive price. Take advantage of an apartment community that minimizes your commute time. With quick access to Boeing and I-405, you can spend more time at home or enjoying life in Puget Sound. Our pet-friendly community welcomes your dog or cat, with no weight limit. All of our roomy apartment homes come with a full-size washer and dryer, and pantry. Open floor plans, separate dining room, and oversized closets allow you to organize your furniture and belongings the way you want it. Every home comes equipped with a refrigerator, dishwasher, and microwave. Select homes feature a master bedroom and bath, fireplace, and private balcony or patio. Our grand clubhouse is the center of activity at Olin Fields. Rain or shine, it offers numerous ways to get fit, play, and relax. Shoot hoops at our indoor basketball court. Work out when you have time in our fitness center. 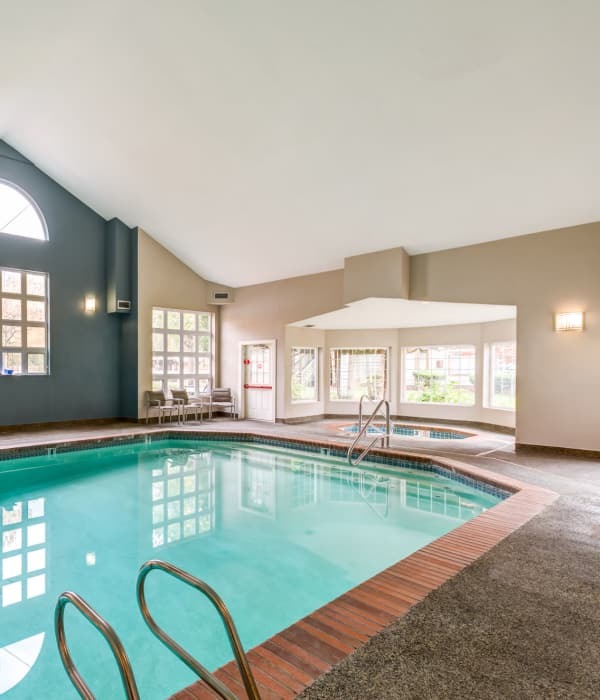 Go for a swim in our indoor or outdoor pool. Our hot tub and lounge give you the perfect opportunity to get to know your neighbors and relax. Our park-like grounds feature native plants and trees, large ponds, and walking trails. Olin Fields Apartments are pet-friendly. An on-site dog park is coming soon. We are within minutes of local dog parks and Mukilteo Beach. Come see for yourself what makes Olin Fields Apartments the perfect community in Everett. Browse our photos and available floor plans and then contact us to schedule your personal tour.